Looking for a toy for your 5-year-old boy? Perhaps, you are searching for the best possible gift for the first birthday of your niece. Finding gift for children may seem simple but the truth is, it is often overwhelming considering the number of options available. There are also a lot of consideration, one of which and probably the most important is the child’s age. To make sure that your child will love the toy you’ll be buying (in case you have it as a surprise), you may want to look into what a particular age love to do and the toys appropriate to them. If you already had something in mind but cannot decide where to buy, you can browse the wide range of toys at Tiny Tiny Shop Shop for a wide selection of toys. Yes, right after a baby was born, he or she can already benefit from having toys. The babies are still unable to hold or grasp objects at the first few weeks or months but they already enjoy exploring their surrounding using their sense of sight and hearing. Hence, for babies in this age bracket, it is best to give toys that feature brightly colored, black-and-white- or high contrast features as well as those that make music. Once they are already able to grasp objects, give toys that are safe to be put in their mouth. Remember to avoid toys with ribbons, string or anything that can cause dangerous entanglement. A baby within this age bracket loves toys that allow him or her to make use of her or his newly learned motor skills and those that respond to his or her actions. They are fueled by wonder and curiosity. They will take pleasure to activities such as hitting a ball with a toy hammer. You can possibly give puzzles with as little as 4-5 pieces, rubber ducks for bath time, huge play vehicles, etc. The toddlers will now take pleasure in playing active games that allow them to jump, climb, and throw. They also now have a good finger and hand coordination and will prefer to use these skills through doping crafts and arts, puppets, completing simple puzzles and blocks. 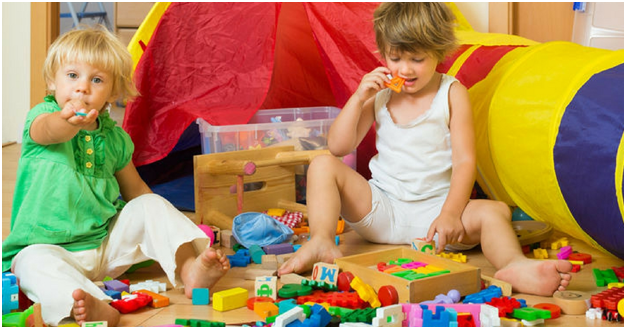 This is also the age when a child start to do pretend play or imaginative play. For children within this age bracket, give educational and interactive toys. They will also love toys which teach verbal and math skills like mini computers, phonics board. They can now start fantasizing about becoming doctors, police officers, and teachers. Some of the best toys to give them include board games, Barbie or dolls, toy vehicles as well as bicycle, and a little complex puzzle. School-age children appreciate and enjoy playing games that needs skill and strategy. If you are going to buy a toy for a child within this age bracket, you can probably get classic toys such as marbles, board games, action figures, career and fashion dolls, as well as toys that let them explore different types of grown-up world. You can find a wide range of toys including kids sports toys at Tiny Tiny Shop Shop that your kids would surely love.